$I$ is a point of the circle of diameter $JK$. The perpendicular bisector of $JK$ cut the semi-circle not containing $I$ at $M$. Let $N$ and $P$ be the orthogonal projections of $M$ on $IJ$ and $IP$. Prove that $\angle JMN=\angle PMK$. 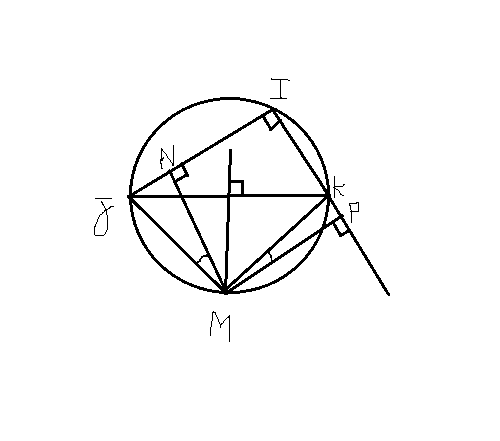 The next question asks to prove that $JMN$ and $KMP$ are congruent. Maybe there's a shorter way in this case but how can I simplify angle chasing for students? Browse other questions tagged secondary-education geometry or ask your own question. How to explain that we live in a three-dimensional world? symmetry of a square - is it possible pure geometric approach in didactics? What can I teach a talented student who is enthusiastic about math?